Reflective Stimsonite Road / Pavement Markers. Very bright and simple to install. Currently available in blue, yellow, white, yellow/red, green, red and white/red. Great for road, parking lot marking, fire hydrant marking and other uses. The Stimsonite model C88/80 markers are reflective from both directions. If you are using these markers on a DOT (department of transportation) roadway you should verify that the C88/80 marker is approved in your area. Can be applied using our "adhesive double stick butyl pads" or our "melt down thermoplastic pads". You can also use two part epoxy which is available in small tubes at Lowes or Home Depot. 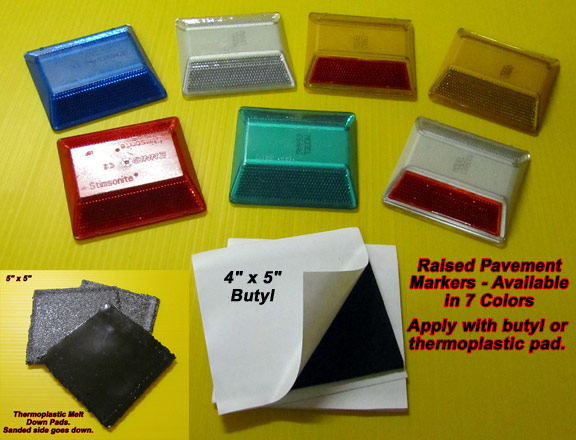 Our markers can be purchased with or without an adhesive 4" x 5" butyl double sided pad or a 4.25" x 4.25" melt down thermoplastic pad. Both are very easy to install. For the self adhesive buytl pad just peel one side of the pad, stick it to the pavement, then peel the other side and apply the marker. Then press in the marker with your vehicle tire. Click here for installation instructions and pictures of the butyl pads. To use the thermoplastic pad just heat the asphalt with a torch, lay the pad down, heat the pad, and press in the marker. The thermoplastic pads take a minute extra to install but are much more permanent. Click here for installation instructions and pictures of the melt down thermoplastic pads. Cost is $4 per reflector and $2 for each butyl pad. Make your selection above.